Ginger’s pups are just now starting to walk out of the dog house. There is one adventerous pup; the others have not gotten brave enough to come completely out yet. I took 3 quick videos for everyone to see. I just added new planned breedings for 2011 here: http://www.bryantsreddevils.com/Breedings.htm. We are increasing the number of breedings we will have next year because the demand for our puppies has increased to the point that we cannot provide enough pups to the good homes that are expecting them. However, we still plan to keep a low number of breedings because we do not believe in producing large quantities of puppies. We are only going to produce an amount that we can safely guarantee will be provided with good loving homes. Buyers need to get their deposits in fast as our litters get reserved very quickly. If any of the breedings do not work out, buyers will have the option to either wait until another year, or they can be moved to another litter. It will be their choice. Semi-Sweet doesn’t appear to be pregnant. I took a picture of her this morning so y’all can see her condition. 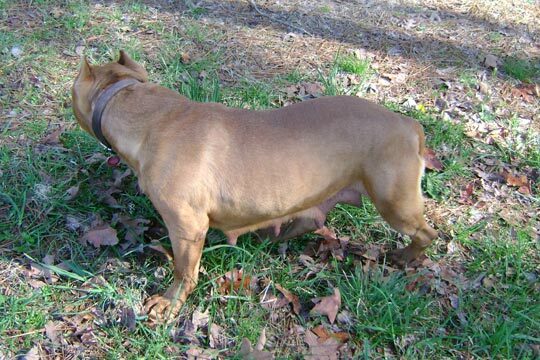 I believe she is just fat from the winter and getting old, if she has pups it will definitely surprise me. Ginger is getting huge! Here is a video I took this morning of her waddling down the road on our property on her morning walk. You are currently browsing the Bryant's Red Devils Blog blog archives for April, 2010.